A computer generated image of the 2012 Olympic stadium in London. Image: London 2012. It's not the winning, it's the taking part that counts. At least, that's what the Olympic creed would have us believe. But, like it or not, what the media and governments focus on is the tally of gold medals. In 1996 Britain was pilloried for obtaining only one gold. Compare that with Beijing 2008, where Britain won nineteen. One journalist claimed this was a sign that the UK was now nineteen times as good as it had been — but surely silver and bronze must count for something. A traditional, though far from perfect way to assess performance is to score 3 points for a gold, 2 for silver and 1 for bronze. Using this method, Britain tallied 25 points in 1996, and 98 in 2008, a dramatic improvement but certainly not 19 times better. However, to get a sense of how good this really was, we need a sense of how well a country might be expected to perform. Many sports require expensive training facilities, and the affluence of a nation will affect how many such facilities it can afford. Another factor that is bound to influence the number of medals is the size of the population — a larger population is likely to have a larger pool of outstanding athletes. So one sensible way of comparing countries' Olympic performance is by plotting the number of medal points a country achieves against its Gross Domestic Product (GDP), a single statistic that reflects a combination of its size and affluence. The chart below shows the performances of a range of countries at the Beijing Olympics. To help comparison, a straight line has been drawn from the origin through the point represented by Germany, our traditional sporting rivals. 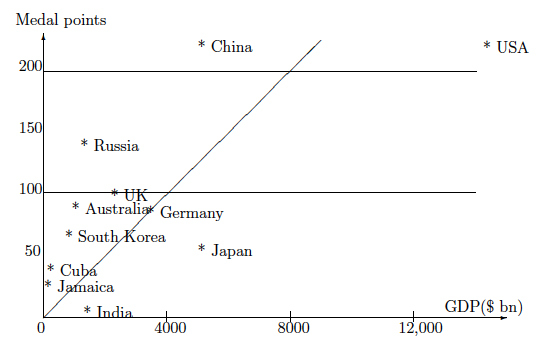 Countries featuring above this line have, on this crude measure, performed better than might have been expected for a country of their wealth; countries below the line have fared worse. Despite heading the total points table, the vast GDP of the USA indicates that the country might be disappointed with the outcome, while Russia (small GDP in relation to population) and Australia show up well. Cuba's position owes much to its success in boxing, while Jamaica's sprinters did spectacularly well. Britain's success is notable. The graph suggests we might have expected to achieve about 60 points, so the nation performed about 60% better than Germany. Comfortably below the line lie Japan and, most starkly, India. Why is India such an under-performer in the Olympics? The main reason is that their country is obsessed with cricket, and cricket has not featured as a sport in the Olympics since 1900 (when Britain pipped France to claim the gold medal). If you want lots of medals, you do need to specialise in sports that feature in the tournament. Are some golds worth more than others? An important assumption in the simple analysis above is that all gold medals are equal in value, but — sacrilegious as it may sound — this is surely false. Not all sports are equally accessible to every country. Cost and geography are major factors in providing opportunities to compete. The medal table for the winter Olympics is dominated by countries with cold, snowy winters. In the summer Games, sailing (for example) tends to be dominated by countries with coastlines, especially rich ones, as boats are not cheap. It is a safe bet that there will be no Nepalese yachting medals in London 2012. So if an affluent country is looking to invest in particular sports to achieve as many gold medals as possible, it should look for sports where barriers to entry (e.g. expensive facilities such as cycling, yachting, or equestrian events) will reduce the competition. The chart above indicates South Korea as an example of judicious investment. Its exalted position in 2008 was no fluke, as its tally of medals from archery, taekwondo, and judo in particular has been consistently high in recent Games. 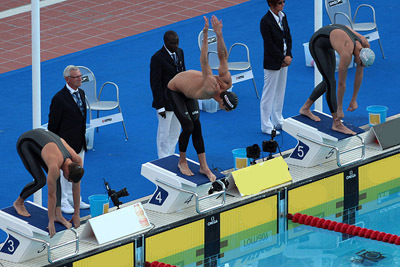 Michael Phelps at the start of the 200m butterfly semi-final during 2009 FINA World Championships. Image: Michael Jelijs. There are also sports where individuals can bring home more than one medal. In 2004, Kelly Holmes famously won golds in both the 800 and 1500 metres, but this pales in comparison with the achievements of the swimmer Michael Phelps, who added eight golds in 2008 to the six gold (and two bronze) he had won in 2004. This is a staggering achievement, but it helped that Phelps was in a sport that gave him so many opportunities in closely related disciplines. For example, results in the 100 and the 200 metre butterfly can be expected to be very highly correlated: if a country can produce a swimmer who is exceptional in one swimming discipline, the chances are high that this swimmer will deliver several medals. At the other extreme, consider the decathlon. This is a sport requiring a contestant to perform to a high standard in ten different disciplines, with only one gold medal on offer. Few athletes are highly competent at both 100 metres and 1500 metres, or at both the shot put and the high jump. But it does turn out that there are good correlations between performance in some of these ten events: good sprinters tend to do well in the long jump, shot putters adopt well to the discus. One study found that strength in the long jump was the best indicator of overall strength in the decathlon, followed by the discus. A national coach looking for potential decathletes might well suggest that the best long jumpers should give the discus a try. And which event is the fairest and most accessible to all countries, regardless of wealth? Perhaps it is the marathon, which has few barriers to entry: is this the most prestigious gold medal of all? Only one thing beats winning a gold medal, and that is doing so while also breaking the world record. A following wind can be a significant help to athletes, shaving tenths of seconds off a sprinter's time. A crude model suggests that each 1 metre/second of following wind saves about 0.06 seconds in the 100 metres. It is understandable that in sprint events or the long jump, a "world record" does not count if the following wind is in excess of 2 metres per second. Remarkably, however, in field events there is nothing to disqualify help from Mother Nature. A sudden gust of wind in the javelin can add metres to the throw, moving an also-ran into gold medal position, which is why stadium designers put a lot of effort into seeking to eliminate most of the air movement. Even in still air, there are factors that can help athletes. At high altitude, the air is thinner, enabling sprinters to run faster. The thin air can also help shot-putters by reducing air resistance, and altitude also has one other effect. , the acceleration due to gravity. For any given velocity , if were zero, the optimum angle of release would be 45 degrees, but since is non-zero, the best angle is slightly lower. Moreover, the structure of the human body means that the achievable value of depends on this angle of release: overall, the optimum angle is about 42 degrees. For elite males, is around 2 metres, about 14 metres per second. School physics tends to treat as a constant, just less than , but it does vary with both altitude and latitude. The nearer to the Equator (where the Earth bulges), and the higher the altitude, the lower the pull of gravity. A reduction in would translate into an increase of around 20 cm in shot-put distance. The National Physical Laboratory has published a formula for . At Mexico City (latitude 19 degrees, altitude 2300 metres), the value of is some lower than at sea-level Helsinki, latitude 60 degrees. Competing in Mexico City is worth an additional 8 cm over the same throw in Helsinki. So to maximise the chance of a world record, head for Mexico City and wait for a windy day. What sports should the Olympics lose? Should tennis be an Olympic sport? 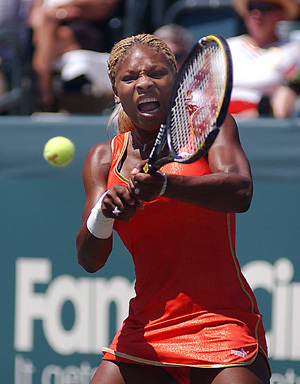 Serena Williams returns a shot. Have the Olympics expanded too much? Rather than add sports, might some be discarded? There are some sports that many argue do not really belong in the Olympics at all, and there are mathematical justifications for excluding them. Football and tennis are two sports in which the Olympics are clearly not the pre-eminent world contest. Football's World Cup, and the four annual major tournaments in tennis are the priority for fans and players alike. Who remembers the gold medal winners in the Olympics? The best players often do not take part, and, in the case of football, many of them are excluded by the rules which, apart from up to three "wild cards", insist that players be under 23 years of age. A more mathematical reason that football is a suspect Olympics sport is that, being a low-scoring game, it lends itself to upsets where the underdog can score a fluke goal and hang on to win 1-0. On the one hand this adds to the excitement, on the other it means that the best team is less likely to win the tournament. Neither Brazil nor Germany has ever won the football Gold medal. In 2018, golf is due to appear in the Olympics. Once again, this is a sport that already has major tournaments which top players will regard as more important. But for mathematical reasons, golf might well be the most suspect Olympic sport of all, in the sense that the player who is acknowledged as the best in the world, is quite unlikely to win the gold medal. The element of luck in golf means that the score over 18 holes is subject to chance effects of a significant size — the variance in the score is comparatively large. Perhaps the mean score of the best player over one round is 70; a set of scores over four rounds such as 68, 74, 67 and 71 might be typical, giving a range of seven shots between best and worst. What makes the scores in golf so volatile is the high hazard rate that players experience. In sports such as rifle shooting, a tiny error might penalise a player by a point. Almost no luck is involved. In golf, however, a tiny change in the direction of a shot can be the difference between a ball landing safely on the fairway as intended and the same ball rolling into a deep bunker and adding two or three strokes to the score. Bring together 50 golfers, and there is a good chance that one of them, well outside the real elite, will put together the best set of four rounds. In any given tournament, many of those seen as the top ten in the world will finish well outside the top ten. In 2010, Britain's Lee Westwood became ranked as the world's Number 1 golfer, without ever having won a major tournament (see here for more information on golf ranking). On the face of it, the Olympics are about identifying the world's champion performers. But from a mathematical point of view, it does appear that, as George Orwell might have said, some golds are more equal than others. Rob Eastaway is an author and the Director of Maths Inspiration. John Haigh recently retired from teaching statistics at Sussex University. Their latest book, The hidden maths of sport, takes a fascinating look at maths in all sorts of sports and has been reviewed in Plus.
" ... Football's World Cup, and the four annual major tournaments in tennis are the priority for fans and players alike. Who remembers the gold medal winners in the Olympics?"